This year marked the 6th annual American Muscle Charity Car Show, the largest charity car show on the East Coast and Special Olympics PA was chosen as the benefiting charity!!! Thanks, American Muscle! 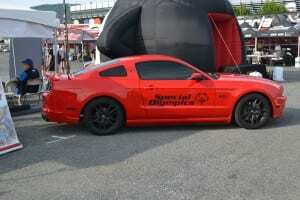 On August 16, 2014 thousands of mustangs and even more mustang fanatics came together at Maple Grove Raceway in Mohnton, PA to enjoy all things Mustang! Celebrity guests like Chip Foose, along with a ton of neat vendors, car competitions and some great weather made this day an absolute success. Special Olympics PA had a vending both where we promoted our program, encouraged awareness and even had a bocce court set up where show attendees could play some of our athletes in a friendly United game. The main attraction just may have been the incredible BRANDED SPECIAL OLYMPICS RED MUSTANG that was donated to our booth for the day! Some of our athletes came out to enjoy the show and even chose their favorite mustang of the show to receive an award! The show concluded with a check presentation donating $31,200 from American Muscle to SOPA, but also a surprise donation of $4,300 from the Red Mustang Registry, RMR! Two very generous donations that will significantly impact our program and efforts in the community. 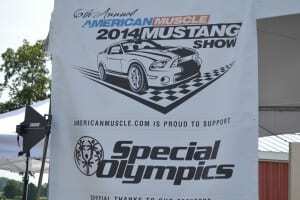 Thank you to American Muscle for selecting Special Olympics and to the car show attendees and partners, like RMR, for really getting behind American Muscle and supporting our great organization!